Consumers today are smarter than ever. They have sufficient knowledge and intuition to recognize the worthy products and services from the clichés and failures. To promote an optimistic sense of approach to your products and services, you need to make your brand popular in the minds of consumers. This requires one to follow a holistic approach of marketing. Through the years, plenty of research have been conducted to determine the best way to achieve brand recognition in the market. New avenues and techniques of marketing are introduced every now and then that promise to give your brand the exposure needed to make it big in the internet business. But there is no clear cut method that can guarantee best reputation to any business. What you can do is follow some of the organic SEO techniques and present your products and services in a human sense to the internet users. The two important techniques that ensures positive brand propagation is inbound and outbound marketing. 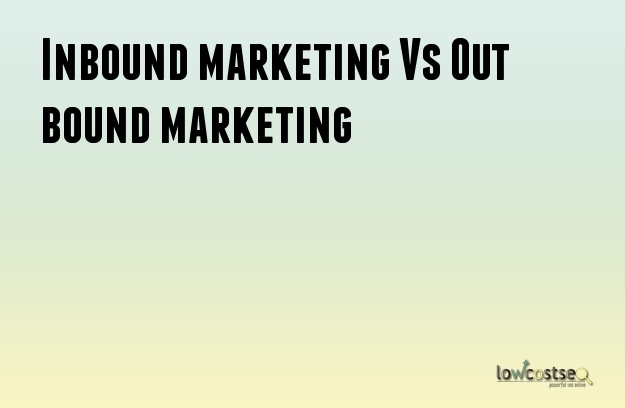 How is inbound marketing different from the outbound marketing? Inbound marketing is a popular phenomenon where businesses spot customers by using paid marketing and search engine efforts. The process includes promoting products and services through e-newsletters, blogs, podcasts, SEO, whitepapers, videos, social media marketing, e-books and others. The efforts are made to introduce brand to the customers and make them interested in buying products. Outbound marketing on the contrary includes promotion through seminars, cold calling, radio and televisions ads, trade shows, telemarketing, sales flyers, print advertisements and little bit of spamming. This form of marketing in the nutshell, for the most part is a traditional form of marketing that a company gives to its target audience. Marketing by using outbound and inbound marketing is an effective strategy for generating leads. Both these marketing schemes can increase your leads and ROI. According to the research and studies, organizations usually invest more marketing funds on outbound marketing. Almost 90% of the funds go in outbound marketing and only 10% is invested in inbound marketing. If you are smart enough, you might have realized that most consumers have already migrated to internet. So you have to invest more in inbound marketing to get more leads. Hiring a SEO company is the best way to get access to various inbound marketing schemes. You can easily find the best SEO service provider online who provides low cost seo services.